During a break from the conference yesterday afternoon, I took the bus from Taylor’s Hill into the centre of Galway, passing the campus of NUI Galway and the cathedral, and hopping off at Eyre Square. I was in search of some of the houses in Galway that have links with the Comerford family, and in particular the house in Forster Street off Eyre Square associated with Charles ffrench Blake-Forster (1851-1874), the romantic Victorian genealogist who popularised many of the stories about the origins of the Comerford family in Ireland, and whose mother, Mary Josephine Comerford, was from Galway. ‘Amongst the chivalrous and bold warriors (all of whom were not Normans) who accompanied William II, second reigning Duke of Normandy, surnamed the Conqueror, in his invasion of England, AD 1066, was Sir Fulco de Comerford, under whose azure banner, on which was emblazoned three mullets or, fought twenty men-at-arms, and four knights of his own kindred to aid William of Normandy in his invasion of England in 1066. After the conquest Sir Fulco received a grant of several lordships from William the Conqueror, and from him descended De Comerford [sic], of the county of Stafford, whose younger brother, Sir Henry, and his nephew, Sir Fulco de Comerford, came to Ireland in the rain of Prince John, son of King Henry II, in 1189. Fulco returned to England with the Earl of Montaigne; but Sir Henry remained in Ireland, and, marrying a sister of the powerful Hugo de Lacy, Governor of Ireland, became possessed of considerable property, and was ancestor of the Irish Comerfords; according to an ancient vellum Ms, “Hee was ane gudely knyghte, and ancesture of ye Comerfords, Barons of Dangeanmor”.’ [Blake-Forster, Irish Chieftains] (Dublin: McGlashran & Gill, 1872, p. 476, n. 68). Henry Comerford inherited Ballykeel House, or Ballykeale House, near Ennistymon and Kilfenora, Co Clare, once the home of the Lysaght family, in 1839, and it passed from Henry Comerford to the Blake-Forster family in 1846 when his eldest daughter and co-heiress, Mary Josephine, married Captain Francis Blake-Forster, JP, of Castle Forster – the name the Blake-Forsters gave to the old French estate in the Doorus Demesne near Kinvara. Francis and Mary Josephine (Comerford) Blake-Forster were the parents of Charles ffrench Blake-Forster, who became a prodigal but controversial journalist, writer, historical novelist, periodical writer and genealogist. Charles Blake-Forster was born in Forster House, Forster Street, Galway, and was proud of his descent from the Comerford family and his long lineage traced through the Blake-Forster and ffrench families, and his grandmother was a sister of the last Warden of Galway, Edmund ffrench. Francis Blake-Forster, of Ashfield and Knockmoy Abbey, Co Galway, was born at Raford, his grandfather’s home, in 1787. In 1810, he married the Hon Rose ffrench, daughter of Thomas Hamilton ffrench, 2nd Baron ffrench, of Castle ffrench, Co Galway. Francis and Rose Blake-Forster were the parents of five children – two sons and three daughters. Their two sons were Captain Francis Blake-Forster, JP, of Forster House, Forster Street, Galway, and Ballykeale House, Co Clare, and Robert Blake-Forster of Ashfield. In 1846, the elder son, Captain Francis Blake-Forster, JP, of Castle Forster, married Mary Josephine, eldest daughter and co-heiress of Henry Comerford, JP of Ballykeale House, Co Clare. Their elder son, Charles ffrench Blake-Forster, was born in Forster House on Forster Street and was privately educated at home and later in England. On his return from England in his late teens, he began to play a prominent part in public affairs in Galway, and he began writing for local newspapers, including the Galway Vindicator and the Galway Express. His only full-length published book was The Irish Chieftains, or, a struggle for the Crown, was published in 1872. In this book, he does not give his source for ‘an ancient vellum Ms’ that contained the family tree of the Comerfords and it has never been traced. He became a town councillor in Galway, a member of the local Board of Guardians, and he was only 23 when he became High Sheriff of Galway in 1874. As High Sheriff of Galway Town, he presided at three Parliamentary elections in 1874. Sadly, later that year he died of a brain haemorrhage, brought on by overwork, at his father’s house in Forster Street, Galway, on 9 September 1874. He was 23 and unmarried, and was buried in the family vault at Bushypark Church, on the Galway-Oughterard road. On Thursday afternoon, I walked part of the length of Forster Street, but failed in my searches to find Forster Street House which stands at 48 Forster Street. This large house was designed and built around 1850 by William Forster, and it occupies a prominent position overlooking Lough Atalia. I understand it is imposing and attractive house on one of the main approaches to the city centre. Having failed, during this week’s visit, to find the house on Forster Street where Charles ffrench Blake-Forster was born in 1851, I headed back through the city to the Spanish Arch on the banks of the River Corrib. The Galway City Museum, behind the Spanish Arch, opened ten years ago in 2007. 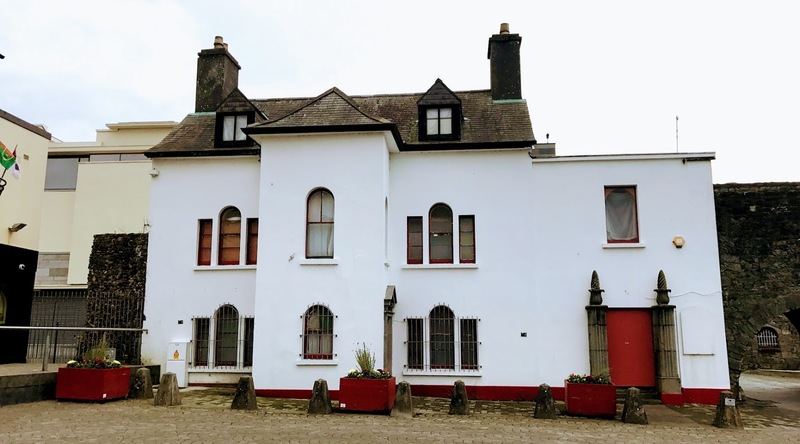 Until then, the City Museum had been housed in Comerford House, beside the Spanish Arch. William JV Comerford was also a well-known local historian in Co Galway, and he believed his branch of the Comerford family was descended from the Comerford family of Inchiholohan, Co Kilkenny. His historical papers included: ‘Some notes on the Borough of Tuam and its records, 1817–1822,’ in the Journal of the Galway Archaeological and Historical Society. He was a founding member of the Old Tuam Society in 1942. He moved to Comerford House, beside the Spanish Arch, Galway, in the 1950s, but when he retired in the 1970s he moved to Dublin, where he died. Comerford House was built beside the Spanish Arch around 1800. The best-known tenant of the Comerfords in this house was the sculptor Clare Sherridan, a cousin of both Sir Winston Churchill and Sir Shane Leslie. She is said to have had romantic interludes with Trotsky, Mussolini, Ataturk and even Charlie Chaplin, and after her conversion to Roman Catholicism she used one large room in the house as her private chapel. The house as later donated to Galway Corporation and from 1976 to 2004 it housed Galway City Museum, before the museum moved to a new building. Today, as I found it in 2010, Comerford House is still suffering sadly from neglect, crumbling and decaying, and in need of restoration. The square-headed door opening which is now closed up without any respect or dignity, has fluted flanking piers with plinths, one pier retaining a finial comprising acanthus leaves and barley-sugar cone. Behind Comerford House and alongside it are the extensions to Galway’s old city walls, built in 1584. For many years, the Spanish Arch was known as the Blind Arch, and its present name is only a recent innovation, perhaps an attempt to enhance Galway’s romantic, Latin reputation. Across the open space in front of the Spanish Arch and Comerford House stands a small monument dedicated to Christopher Columbus. Local lore claims Columbus visited Galway and that looking out to the Atlantic from this spot he was inspired to set out on the voyage that led to his discovery of America. My voyage of discovery on Thursday afternoon was incomplete. I have to return.